It is important to know how to use wood filler to conceal small defects in your woodworking projects. 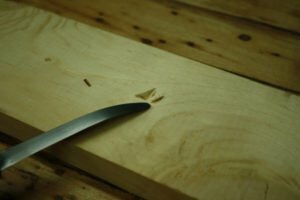 Though the goal is never to need wood filler, even the best of us need a little help once in a while. When this happens, knowing the easy way to fill and level a void is beneficial.. There is another time when concealing a defect with wood filler is important. Sometimes, a great piece of wood will have a couple dents or dings. These are not difficult to conceal with wood filler. Depending on what type you decide to buy, the product comes in a number of different colors. These can be used to get a close match to the species being filled. 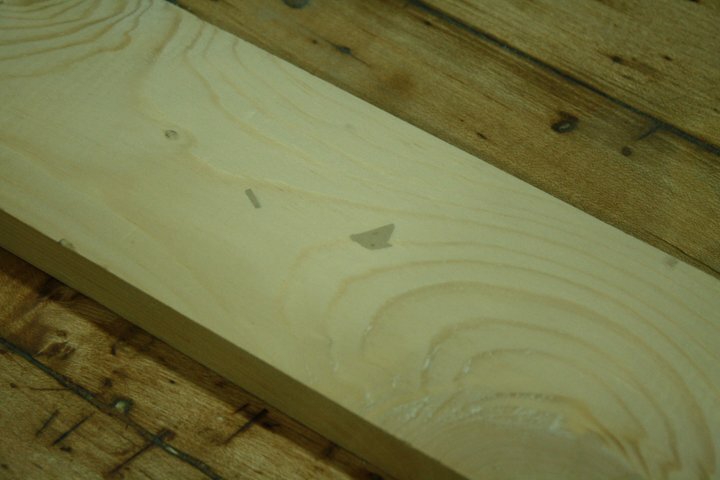 Wood that is sold in the big home improvement stores is typically loaded with defects. Staples, dings from machinery, and defects from customer handling are the most common. 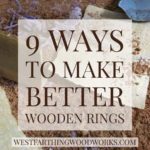 All of these are easy to remedy if you know how to use wood filler. For this example, I am using a piece of scrap Pine from the shop. There are two defects on the board that need to be filled, both right in the middle. The one on the left I created by stabbing the surface with a screwdriver. The one on the right, I made with the claw of a hammer. Both of these could have easily happened on accident, or by dropping the project I was working on. The first part of the filling process is to make sure that your voids are capable of accepting filler material. This first part will help ensure that the fill stays in place for a very long time. If your surface is finished already, make sure to pay close attention to this step. Look at the voids closely. If there are any loose pieces of wood stuck inside, remove them with a knife or sharp tool. Loose pieces prevent good adhesion of the filler material, and can cause problems later in the process. 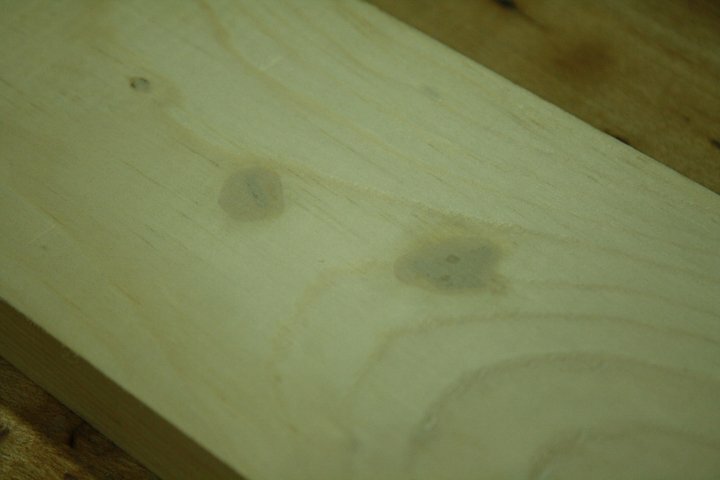 Also, if your surface is finished or painted, scratch off as much of that as you can to expose the wood. Sometimes, wood filler does not like to stick to finish coats. 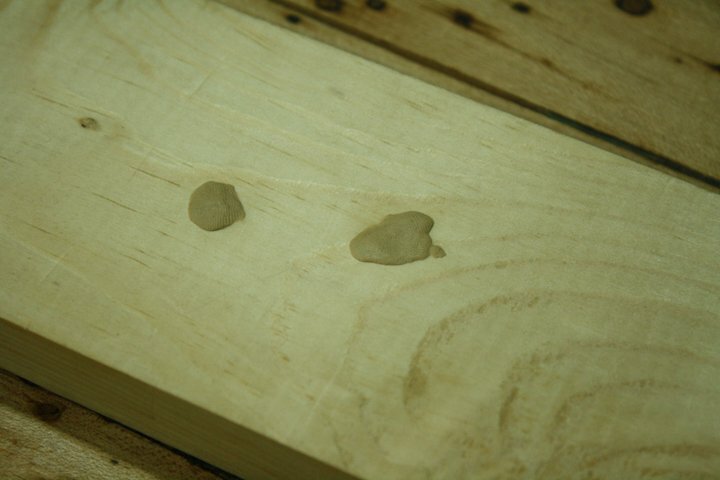 If you remove that layer, and expose more wood, the wood putty will adhere much better. 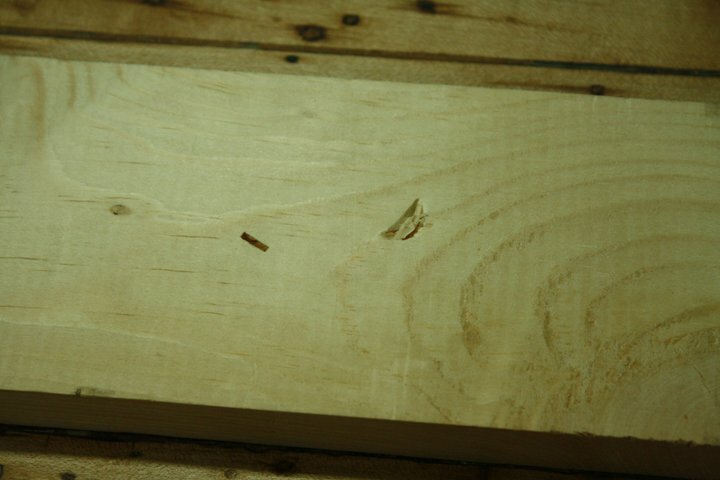 Lastly, blow out the holes to remove any sawdust or fine debris. The product that I use for the majority of my fills is made by Mohawk. It’s called an epoxy putty stick, and it can be found online or in fine finishing/woodworking stores. There are a few other brands that make fillers like these, with LocTite being another good maker. 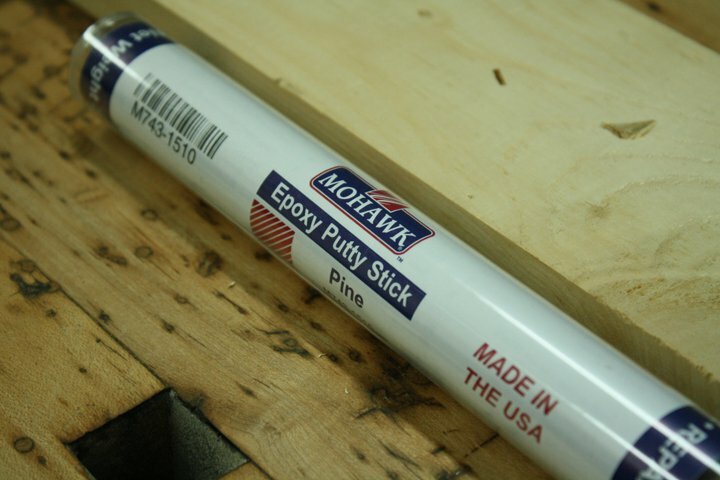 The Mohawk Epoxy Putty Stick is essentially two part epoxy, shaped into a log. The center of the log is the activator, and wrapped around that is a colored resin. When the two are mixed, a reaction takes place. This reaction causes the product to harden rapidly, greatly reducing the wait time before it can be sanded. 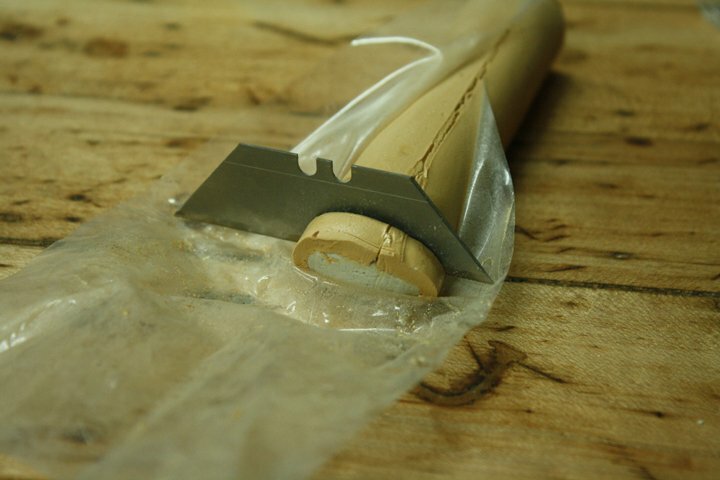 Open the package and expose one end of the putty stick. 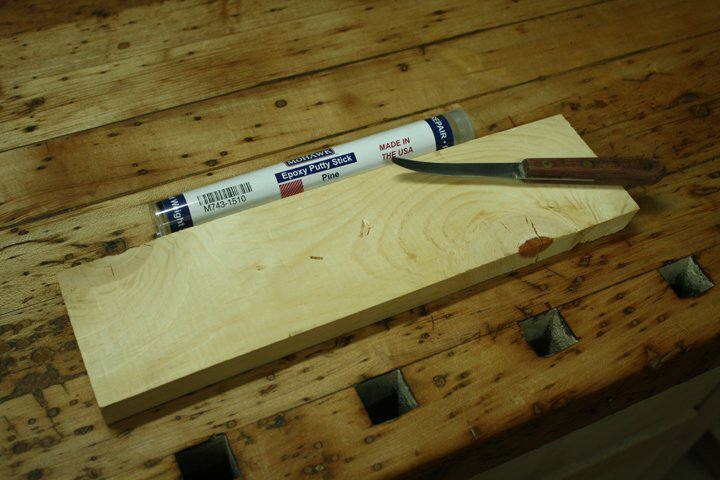 Use a knife or a razor blade to cut off a flat section from the end. 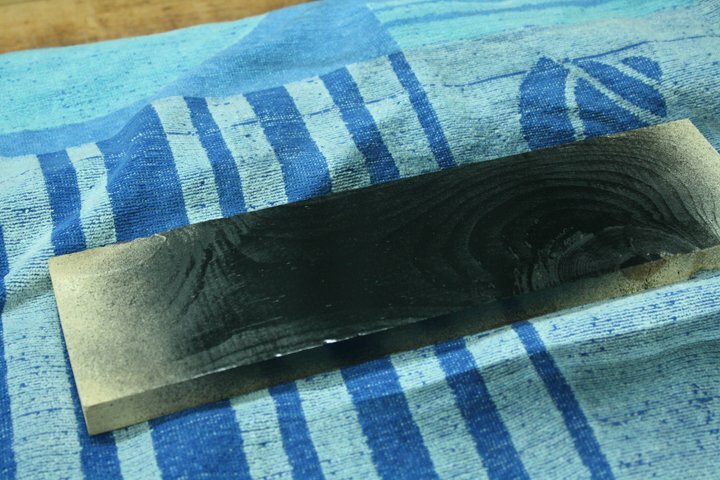 Since the activator and resin need to be in a certain proportion to work, make sure to cut directly through the log. Once you have a piece, it will look like a flat white disk, with a colored ring around the outside. Cut about as much as you can apply in a couple minutes. Over time you will learn how much you can work with, and how quickly you need to use the product. For a couple small voids, a 1/8″ to 1/4″ thick piece is plenty. Kneed the disk into a ball. The resin and activator need to be mixed well in order to begin hardening. Keep kneading the ball until it is a uniform color. If there are white streaks in the ball, keep on kneading until they are completely blended. If you have been mixing for more than thirty seconds, you may be feeling the wood putty begin to warm up. This is normal, and a part of the hardening process. As it gets warmer, the time to use it begins to run out. Once well mixed, you have about a few minutes to apply the filler where you desire. Press the epoxy wood filler into the voids on your piece. This can be done with a finger, or using a thin flexible knife. If you only have a few fills to work with on your project, the index finger will do the job well. If you have dozens, a tool will save some wear on your finger. The big takeaway from filling these voids is that you want to press the material deep inside, and not leave too much on the surface. The deeper you press the filler, the better hold it will have over time. 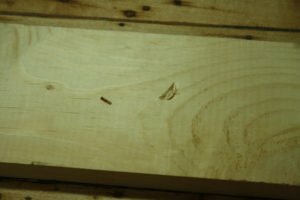 Also, once you have filled the defect, only leave a little extra epoxy over the area that is higher than the surface of the wood. The fill will have to be sanded flush later in the process. If you leave an inch of filler on the piece, it will all have to be sanded off, and that can take a long time. 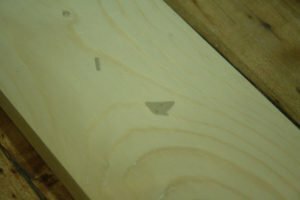 That is not how to use wood filler properly. 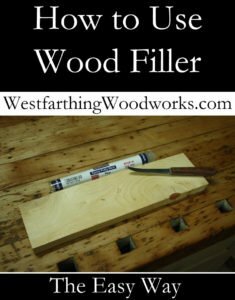 A helpful tip is to save your excess wood filler on the side while you are waiting for your fills to dry. If you sand them too early, they will gum up and pull out of the holes. However, using the excess from the ball as a timer you can easily know when you are able to sand. 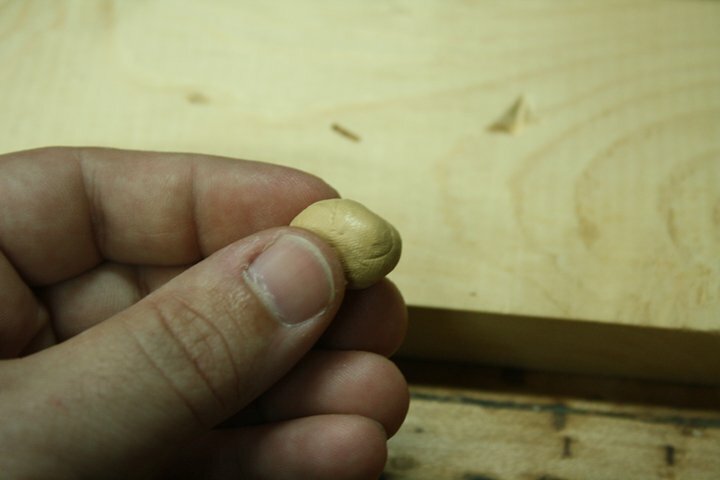 The ball will dry at the same speed as the fill, even though they are different sizes and thicknesses. The product dries through reaction, so the amount doesn’t matter at all. 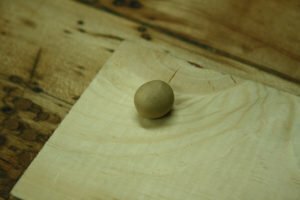 Once you can’t press your fingernail into the ball, and it makes a hard sound when smacked against a surface, the filler is ready to sand. For the Mohawk brand, this is typically about 5-10 minutes. 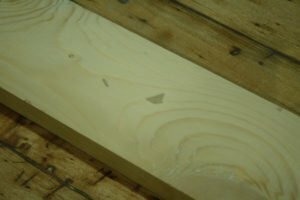 The big trick to getting wood fills that you cannot feel or see is to use a flat block for sanding. I have instructions for making a sanding block here, but it is basically a flat block with cork on the face. There are a few more steps to get it nice and flat, but those are covered in the instructions. 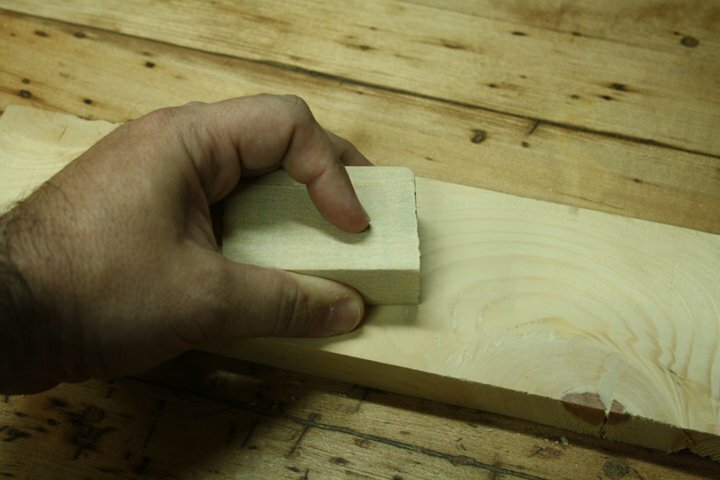 If you sand by hand, your fingers create an uneven surface on the wood. Your fingers are not flat, so they cannot create a flat surface. 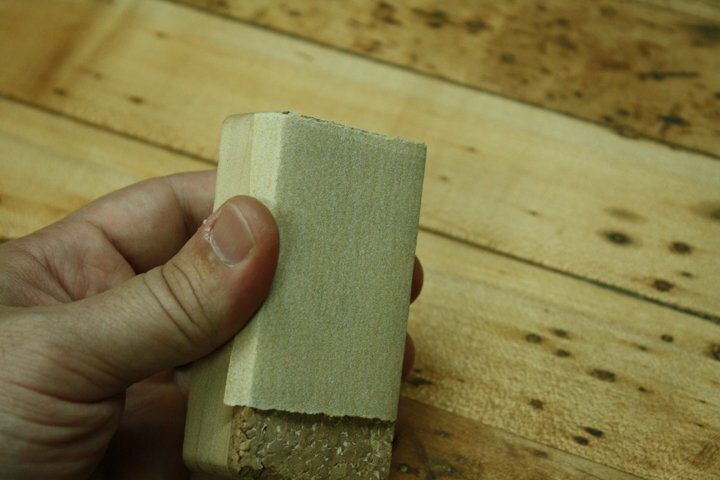 If you use a flat sanding block, and you wrap your sandpaper around it, that problem is eliminated. This is the huge secret to getting a perfectly blended fill. Use a block, and it will level your fill to the surface perfectly. Once the filler material is dry, start with 150 grit sandpaper. 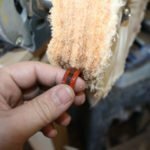 The reason you need to begin with a little rougher sandpaper is to help power through the tops of the fills quickly. The coarse paper is only used to remove the bulk of the fill. 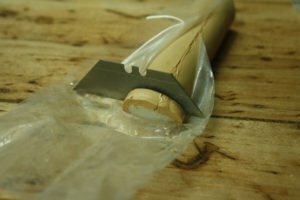 When the fills get closer to the surface, finer grits are used to bring the level perfectly flush without adding unnecessary scratches to the surrounding area. Sand with the 150 grit paper until you can see a fine halo around your fill. If you look in the picture on the left, you can see the outlines of the voids, as well as a ring around them. This ring is an extremely thin layer of filler. So thin in fact, that you can see through it to the wood layer below. Once you get to this point, it is time to switch to a finer grit of paper to take the fill flush to the surface. Switch to 220 grit paper. Wrap it around the block, and sand back and forth over the area with the fills. No matter how tempting it may be, always keep your block flat. The whole point and purpose of the block is to target the high areas, which it will do all by itself without any help. Tipping the block creates deeper areas that will show under a finish, because they are not flat. Also, once you get very close to the fill being flush, make several passes with the block, using very light pressure. 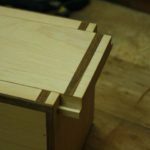 These final dozen strokes gently even out anything that is sticking up, and make it nearly impossible to feel the border between the wood and the filler. The hallmark of a good fill is not being able to feel a transition between the fill and the surrounding area. If you can run a finger over the fill and feel where the edges are, you have a fill that is not perfectly flush to the surface. It may be too high, or it may be too low. Either way, more sanding with the flat block will fix the problem. After sanding, I noticed that there were two darker spots on my fill. This is a sign that the sandpaper did not hit these two spots. If they were not hit, that means they are lower than the surrounding area. Before moving on to paint, I need to sand the area more to reduce the surface level. 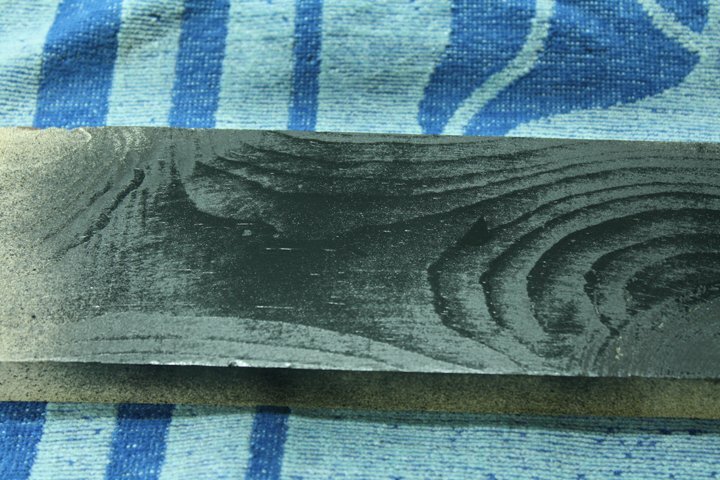 Once the fill is an even color, it means that the entire surface was hit by the sandpaper. Once that happens, the surface is flush and even. The real way to see how good your body work looks is to spray some black paint on the area. A layer of paint will seep into a fine crack and show a bad fill instantly. Looking at the picture, you can faintly see my fill, but that is only because the material used does not have grain, and shows up as a flat spot. 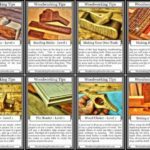 Here is the way to fix that when you are painting or finishing something with a fill. Add another layer of paint over the fill, and see how it looks. In the picture on the left, I added one more layer of paint, for a total of two. I just misted the surface as before, without making a thick layer. With the second coat in place, surface has evened out more, and if this were painted completely, you would never be able to tell where the fills were placed. If you have a hard time finding your fills, you are doing them well, and nobody else will be able to find them either. A little finish or paint, and the layer that is created evens out the surface so well that the fills blend in perfectly. 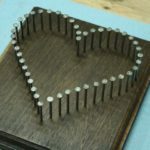 This technique is great for projects that are in the final stages before finishing. Before you do your final sanding, search around it for areas that need to be filled. Fill them all, and then level them as you final sand. Another great application for this is on interior door trim and cases. Most homeowners bang something into the door frame or trim on a weekly basis. These dings are not difficult to repair at all. Also, since the trim is painted, blending them back into the surrounding color is easy too. Check and see if you have touch up paint in the same color as the trim. Fill the void, sand it level, and paint over it to match. I hope you enjoyed learning how to use wood filler, please take a look at some of my other articles below for more. 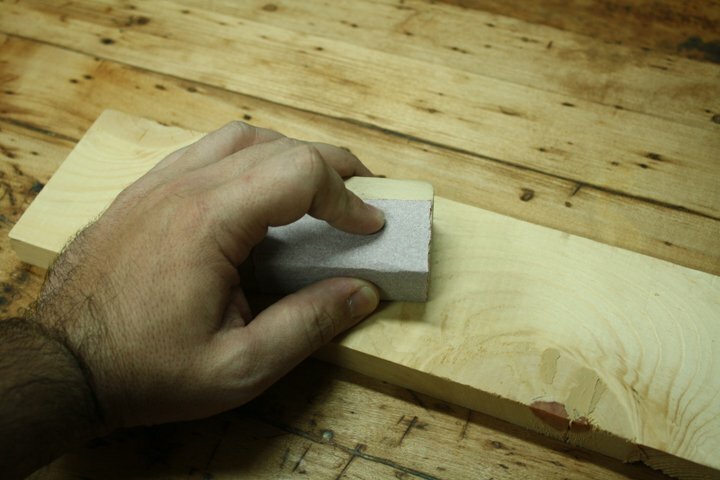 If you use a sanding block regularly, this tip will help you get the most bang for you buck when you buy sandpaper. 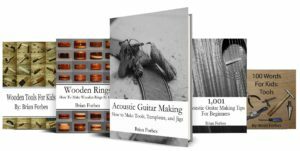 My article on sanding technique also helps to show you how to power through those fills without spending an eternity. 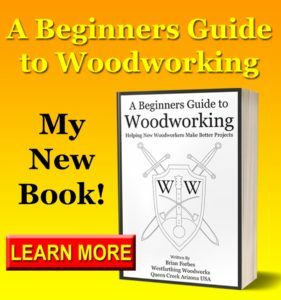 If you have any questions on how to use wood filler, please leave a comment and I will be glad to answer them. Happy building.